Most mythology has its roots in Earth's distant past, when it was ruled by technologically advanced aliens who have since disappeared. They passed themselves off as dieties such Ra, Baal, the Devil and Cronus and built wonders such as the Pyramids, the Great Wall and even Atlantis. These Aliens, the Goa'uld, moved on to other planets seeding human populations throughout the galaxy and have long since forgotten about Earth. Unfortunately, events are about to unfold which will remind them of our existance and draw them back to Earth. No, you need not have watched the TV series in order to play. You win when the Goa'uld and Replicators are wiped out. Your allies are the Rebels and the Asgard. 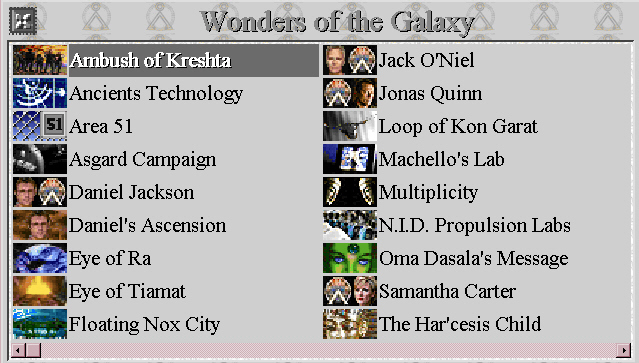 As this is a quest-based game, there are various unique units (usually marked with a question mark) you need to kill in order to obtain new technologies which would otherwise be unavailable. Seven enemy cities (marked as objective cities) also fulfill this function. Star Gate:SG1 is based on the movie and the first seven seasons of the TV series and is the last 'Space' scenario released by Kobayashi. It follows the adventures of a protagonist hero unit, the SG1 team as they gate from planet to planet instantaneously, discovering new civilizations and technologies and of course fight to repeatedly save the Earth. Screen still shots, music, sound effects and voices have been faithfully derived from the tv series and fans of SG1 will be delighted upon the loading the scenario. This is a single-player scenario and multiple quests have been built into the game to unlock new map areas, not unlike Star Trek:Dominion War. It also builds on the zero movement cost wormhole concept, again first used Star Trek:Dominion War but in this case wormhole tiles are only connected at the tips allowing spaceships to crossover. 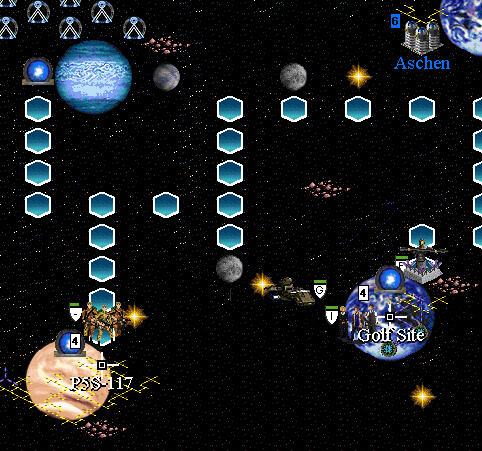 The most striking feature of the SG1 map is the innovative use of a nine tile planet format of which there are four types. Three of these are generated using the forest, mountain, hills terrains but a fourth planet was squeezed out using the less obvious river mouth tiles.